Fazenda Floresta is the culmination of a dream which has blossomed into a beautiful reality for owner Luciana Fasano. Located in Itu, Brazil, it is a tranquil retreat from the frenetic energy of nearby São Paulo, a bustling international hub of a city. Now a verdant sea of lush, green vegetation embracing classic structures and expansive pastures, the historic plantation produced first sugar and then coffee for most of its more than 150-year lifespan. Under Luciana’s guidance, it has become a showplace that is home to some of the world’s finest Arabian horses—and the chocolates, cakes and gelato that bring further fame to the Fazenda Floresta brand. “The love of Arabian horses and the dream of owning them have always been with me,” Luciana affirms. “After you see a beautiful Arabian horse, there is not any other horse. To me, they are perfection,” she states, her eyes shining. “I love everything about the Arabian: the head, the tail carriage, the attitude, the keen intelligence…everything.” It is important to Luciana Fasano that her love for the Arabian horse be recognized as the power and impetus that has inspired her success in fulfilling her dreams. It is that deep love which fed the development Fazenda Floresta into a major force; both as a horse breeder and as an in-demand source for delicious confections. “I have always had a “meta”— a goal…and I always reach my meta,” states Luciana, quiet determination reflected in her face. The farm is an island of serenity, with the sounds of nature wafting on the wisps of a breeze. The grounds contain much more than a revived coffee crop; avocado trees burdened with fruit contribute to the rich bounty, as do many other edibles. Now, the grounds also include the pastures and stables that house the gorgeous Arabian horses of Fazenda Floresta. Before she found the farm, Luciana had been searching far and wide for a peaceful location that matched her vision of a world-class Arabian horse breeding farm. Years ago, she found the graceful acres of the old plantation, which was already an historic site. Luciana was respectful of the heritage of the location and designed and built the stables and offices to augment the atmosphere already inherent. She redesigned the interiors of the original, existing houses with careful attention paid to replicate original architecture, including the use of early 19th century roof tiles. Cobblestone drives and utility roads blossomed across the acres, and lush vegetation took root. It was the perfect update for a grand facility. Today, Fazenda Floresta has additional presentation arenas and turn-outs, a vet lab, a second office suite and a grand stallion barn. It is a stunning, colorful, serene, paradox of a place; both visually stimulating and relaxing. The bold colors of the buildings exude an uplifting energy, while the hum of insects threaten to lull one to sleep. The setting is nearly as much of a paradox as its patroness, Luciana Fasano, a respected businesswoman who speaks five different languages. She has traveled the world over as the creator of designer fabrics and boutique chocolate, after spending her youth growing her love of horses. A fierce, world-class athlete, Luciana began competing in cross-country jumping when she was only six-years old. At about the age of 21, she met a Brazilian breeder who gave her a Half-Arabian grandson of El Shaklan. On a cross-country trail ride, Luciana fell from her horse, breaking her shoulder. Instead of wandering off and leaving Luciana to suffer, the horse stayed with her for hours until help arrived. Little wonder the sparkle in Luciana’s eyes when she speaks of the Arabian horse that has claimed her heart! “At that time,” recalls Luciana, “I went to all the Arabian horse shows in Brazil – and soon found out about Lenita Perroy and her horses. I had heard of Ali Jamaal and immediately noticed a difference in her horses. Each time an Ali Jamaal horse entered the ring, I could see a difference from the others competing. Her horses were special.” At the time, Ali Jamaal was about 24 and even though Luciana admired Lenita’s horses, it would be many years later before they were to meet; years spent focusing on fashion and her career, living in the United States and then in Vienna, Austria and the remarkable birth of her son Filipe. It would be a meeting that would change Luciana’s life and alter the careers of some very impressive stallions. In 2009, Luciana defined a new goal for her Arabian breeding program: owning and showing a horse to a United States National Champion title. Her interest in Lenita Perroy’s renowned herd had continued unabated, which quickly brought her back to Lenita’s Haras Meia Lua. A generous mentor who relished the opportunity to help others, Lenita introduced Luciana to internationally successful trainers who helped her to find a horse with the pedigree and quality necessary to fulfill the meta of being crowned a national champion. Luciana Fasano had no reason to look back. Later that fall, at the 2010 U.S. Nationals, one of her metas was accomplished when her new purchase AAS-Elishahh was named U.S. National Champion Yearling Colt—out-showing some 25 other yearlings in the process. Luciana’s joy when she heard the results was only slightly dimmed by the fact that she could not be there in person to witness the victory. “I couldn’t be at the show,” she laments. “I remember I was shocked when he was named National Champion. It was beyond belief. It was like a dream.” AAS-Elishahh had an active season to start his breeding career in 2011 before he returned to the show ring to garner a World Cup championship, a championship at Region 2 and the hotly-contested title of 2011 U.S. National Champion 2-Year-Old Colt. “Another meta,” Luciana says simply. As a committed breeder, Luciana knew that she had to find additional stallions who would cross well with her Elishahh daughters, and vice versa. Again, she reached out to a woman who was well-known for her superior Arabian breeding program—this time, Belgian breeder Christine Jamar. This time, the goal was a grey stallion with superior pedigree, impressive carriage, perfect balance, and a face and eyes that would make anyone stope and stare. 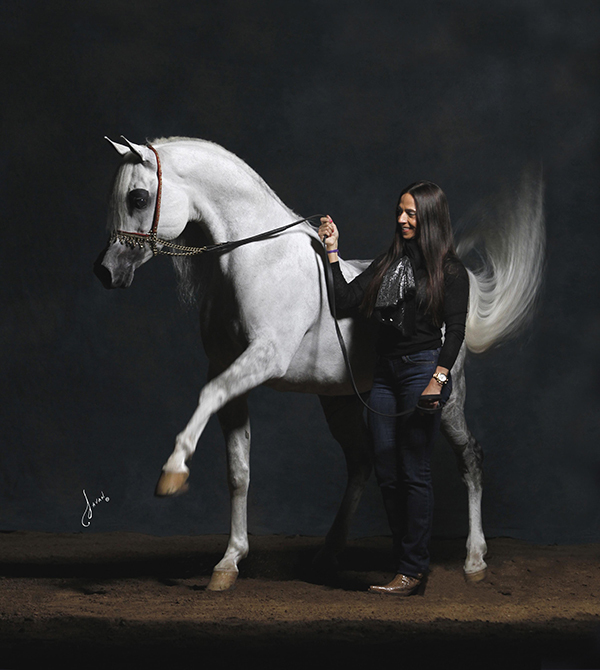 The search led Luciana throughout South America to Europe, then on to the historic desert sands of Israel, and Chen Kedar’s Ariela Arabians, home of the straight Egyptian stallion Al Hadiyah AA. Al Hadiyah AA was everything that Luciana had desired, and a deal was struck. His father was the significant sire of international champions, Laheeb, and he was out of the magnificent black mare The Vision HG, a legendary producer. Al Hadiyah was, perhaps, the best of all worlds. He was an Israeli National Champion as a foal in 2005 and again as a Junior Colt in 2006. In America, Al Hadiyah earned the Bronze Champion Senior Stallion honors at the 2012 U.S. Egyptian Event and was the 2012 World Cup Reserve Champion 6-8-Year-Old Stallion. Tragically, Al Hadiyah AA passed away in February 2018, but not before leaving his offspring to continue his contribution to future generations of Fazenda Floresta horses. A third superstar is U.S. and Canadian National Champion Stallion Eccentric Valentino. Perhaps the best-bred son of the great DA Valentino, Eccentric Valentino is out of U.S. National Champion Amelia B, a daughter of the legendary Magnum Psyche and the phenomenal producer, Amety B. Eccentric Valentino also earned National Reserve Champion honors in Canada (2009), the U.S. (2011) and Brazil (2012). He is already the sire of U.S. National Champion Half-Arabian Gelding, Gian Paul among other champions, and is crossing exceptionally well with straight Egyptian mares. As each meta is accomplished, a new one takes its place. Luciana has continued to add to the Fazenda Floresta list of breeding stallions with the superb trio: LLC Fasario (Aria Impressario x RDF Fabreanna), already the sire of 2016 Brazilian Silver National Champion Junior Stallion, FT Pietro; Vortex (FA El Shawan x Bhonytha ATA), the 2012 Brazilian National Supreme Champion Stallion and National Champion Junior Colt and sire of unanimous champion Junior Colt Amir LF; and Wan and Only SB, sired by U.S. National Reserve Champion Mi Don Wan out of 2005 Canadian National Champion Futurity Filly, Ladie Magnum. When asked what new goals are on the horizon for the Arabian horses, Luciana minces no words. “A World Championship in Paris,” she states. It’s another Luciana meta…which can only mean that it is a promise for the future.